The Ink Trap: October Kard Kits at Kraftin' Kimmie Stamps! Do you live far away from the nearest Krafty store?? Is it hard to choose all your krafty goodies online without seeing them in person?? Or do you ever feel like you’re running out of krafty mojo?? Need a little help putting things together to make a fabulous card?? Or maybe you don’t have the time to design something yourself and want to just be able to put things together quickly! Well, we’ve taken out all the guess work for you and designed a Krafty Kardmaking Kit with everything you need to make SIX awesome cards AND have some goodies leftover to whip up some extras! We’ve taken our krafty know-how and done all the designing for ya!! We’ve chosen and coordinated patterned papers, cardstocks, envelopes, cork adhesive paper and several different types of embellishments including glittery snowflake buttons and charms..... and you’re ready to go!! With the October kit, you’ll also receive YOUR CHOICE of one of our gorgeous $8 stamps!! Choose whichever one you like from our many lines and styles of rubber stamps! - Twelve 6x6 patterned papers – 2 of each of 6 different designs featuring the Snow Day collection by Bo Bunny! - 2 6x6 sheets of adhesive CORK paper! - 1 pkg of assorted glitter snowflake buttons and charms! - YOUR CHOICE of any $8 stamp from ANY of our lines of stamps....including the new ones!! Speaking of $8 stamps, I've once again jumped into the Way Back Machine and used one of my very first Kraftin' Kimmie images...Clara! I remember seeing her on a card 2 or 3 years ago and absolutely falling in love with her. What a sweet beauty! Well, Clara has since been retired, but she is now back in the shop for a limited time. Additionally, our Krafty Girl design team have taken ONLY what's found in this kit (plus their own white cardstock, ink and colouring medium) and created SIX amazing card samples for you (you'll get to see them all as you hop around the links at the bottom of this post)!!! And with this kit you'll receive a gorgeous colour handout, emailed directly to you, featuring pictures of the six cards PLUS some extras and the sketches to go with each creation!! It couldn't be any easier!! Your Krafty Kit will be shipped in a sturdy box so that your goodies are nice and safe!! The VALUE of each kit is over $32 but our price this month is $25!! Shipping in Canada and the US is $12 PLUS when you order the kit, we are offering FREE additional shipping on anything else in the shop that you order at the same time! So go ahead and load up with paper pads, ezmount, more stamps etc. because the shipping is covered! All your goodies will be shipped together in a box for only $12. And this fantastic kit will be released on Saturday night at our LIVE online release party starting at 6:30pm EST on our facebook page, along with all of our new stamps being previewed this week!! We hope you'll join us for all the fun! Now hop around and check out the SIX awesome cards and a couple of insides plus some extra things like some sweet tags, that the Krafty Girls have made to inspire you! Cheryl what a gorgeous card. I love the cute image and your colouring is fab. wow! It is so nice and joyful! very beautiful card! I love this image and it is the very one that sent me into a search for Kimmie Stamps! 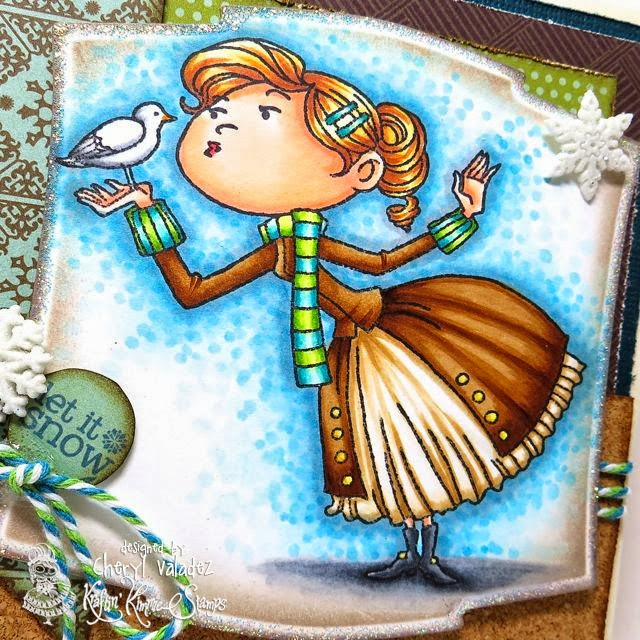 You did a great job creating this card with this adorable little "bird Girl" as I like to refer to her! Fabulous card Cheryl. Love your layout on this card. Wow Cheryl...love this card...the colours are amazing and of course (as always) your colouring is awesome...thanks for sharing and inspiring me.